Hello and Welcome to Camelot Collectables and Antiques! W e have for sale for your consideration this exquisite, beautiful and old. 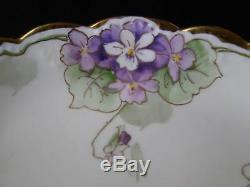 ANTIQUE A K D HAND PAINTED & SIGNED LIMOGES FRANCE VIOLETS BOWL. Dimensions: 7-1/4" Long x 4-3/4" Wide x 1-1/4 Tall. White porcelain with Hand Painted violets decorate all 4 sides of this oval bowl with scalloped, beaded rim on the inside. 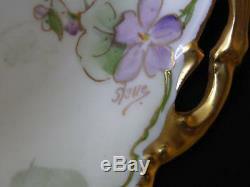 Heavy gold gilt accent the violets and leaves with a wide gold gilt rim border. Open handles with heavy gold gilt on either end. Klingenberg was an accomplished Limoges artisan painter when he opened his own porcelain factory and decorating studio in the Limoges region of France in the early 1880's. There does not seem to be a surfeit of information about Klingenberg or his company other than that he merged with Charles Dwenger's studio sometime in the late 1890's or very early 1900's. Klingenberg & Dwenger together manufactured porcelain products, produced decorated finished porcelain pieces, and exported them world-wide until 1910 when the company closed its doors. While there may be a paucity of detail about A.
Klingenberg and his company, there are numerous astonishingly lovely works of art that this short-lived company left behind. Our photos are the most accurate and are an important part of the description and condition. Most of our pictures are taken with a magnifying lens giving you a clear, close up photo. This tends to also magnify minor flaws on items which many times cannot be seen on actual items. Also, please check measurements given in listings as photos may make items appear larger than they actually are. Condition: Excellent with no chips, cracks, loss of paint, color or gold gilt. Signed by the Artist as shown in 4th photograph. This Lovely Limoges Bowl Displays Beautifully! Will make a wonderful addition to your Limoges collection or as a gift for that Special someone. Thank you for your interest in our Store items and Come Again any time! By purchasing this item you are agreeing to our Policies and Terms. OUR POLICIES - TERMS OF SALE. We can not hurry the Postal Service! These charges are the buyers responsibility. Doing this is against U. PLEASE ask all questions prior to purchasing or request additional pictures, if desired. Most of our items are vintage or antiques and have been previously owned by someone else other than ourselves. We do not know if they come from a non-smoking or pet free home. We describe all items in our listings as accurately as possible. We will list any faults and damage to the best of our ability. Check out our other items. Add a map to your own listings. 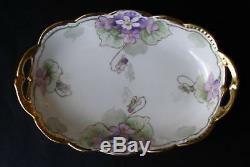 The item "ANTIQUE A K D LIMOGES FRANCE HAND PAINTED VIOLETS HANDLED BOWL SIGNED 7-1/4" is in sale since Sunday, April 25, 2010. 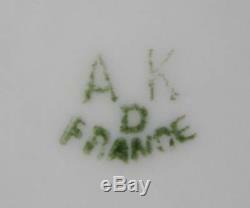 This item is in the category "Collectibles\Decorative Collectibles\Decorative Collectible Brands\Limoges\Other Limoges Collectibles". The seller is "sculley7748" and is located in Germantown, Tennessee. This item can be shipped worldwide.